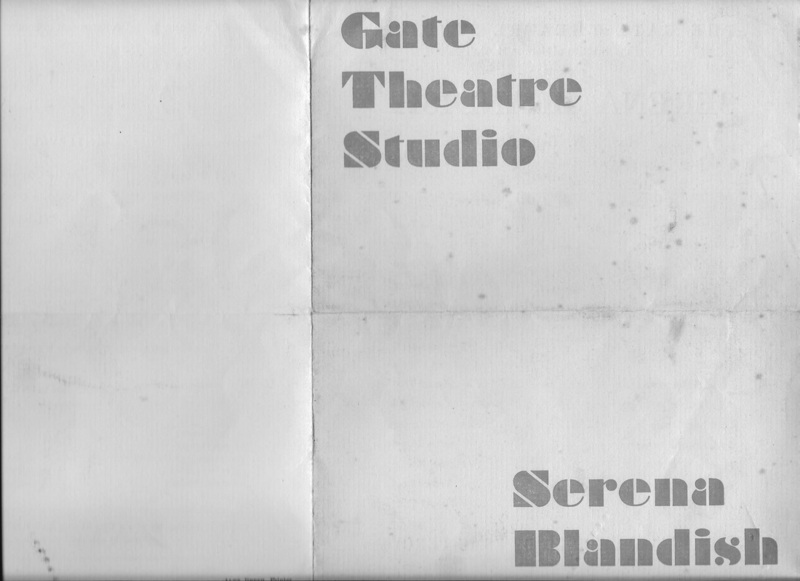 Greta Wood played Mrs Blandish, in the 1938 production of "Serena Blandish" at the Gate Theatre, London. From The Era 5 May 1938. VIVIEN LEIGH will play the title role in a fabulous comedy, ”Serena Blandish,” which will be at the Gate Theatre’s next and last production of the season. American author S. N. Behrman will thus have two plays running here at the same time since the Lunts open in his Amphitryon 38 at the Lyric in the middle of the month. 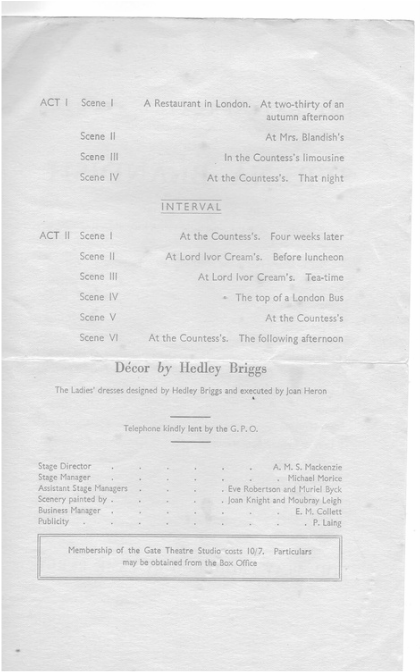 Play was first staged at the Morocco, New York, in January, 1929. It had 93 performances and is said to be of limited sophisticated appeal. From The Era of 22 September, 1938. Serena Blandish. Gate. September 14. The cry against this wispy trifle will be that Serena Blandish isn’t Lady Windermere and S. N. Behrman not Oscar Wilde. But leaving aside Mr. Wilde, which isn't very difficult, this adaptation of the novel, "A Lady of Quality,” is an entertaining little piece, spoilt by an inadequate ending. Little Miss Blandish, wearing an air of innocence which her past cannot support, roams the marble halls seeking marriage and security with the titled and the wealthy. But the foolish girl forgets to leave her heart at home, and after dallying with a lord she becomes the mistress of a young song-writer, who offers his heart, minus the ring. Vivien Leigh plays Serena with a wistful charm which lifts the young lady above comedy, but doesn't land her high enough to reach satire. Jeanne de Casalis as the Countess, with her apes and peacocks, her cynical butler, and her marriage market, blends the flamboyant with the childish to the manner born. Stewart Granger is worldliness personified as Lord Ivan Cream, and Aubrey Dexter creates a Bondstreet jeweller, whose appearances, alas, are all too few. From The Era of 6 October 1938. STEWART GRANGER, an actor new to London, who is now making something a name for himself by his performance opposite Vivian Leigh in Serena Blandish at the Gate Theatre, is making his film debut as the young hero in "So This Is London,” now in production at Pinewood. Granger came to London after playing for some time at Birmingham Repertory Theatre. He is twenty-five. 20th Century-Fox, who are making “So This Is London,” are stated to have plans for him. Newspaper article about "Serena Blandish", taken from the collection. 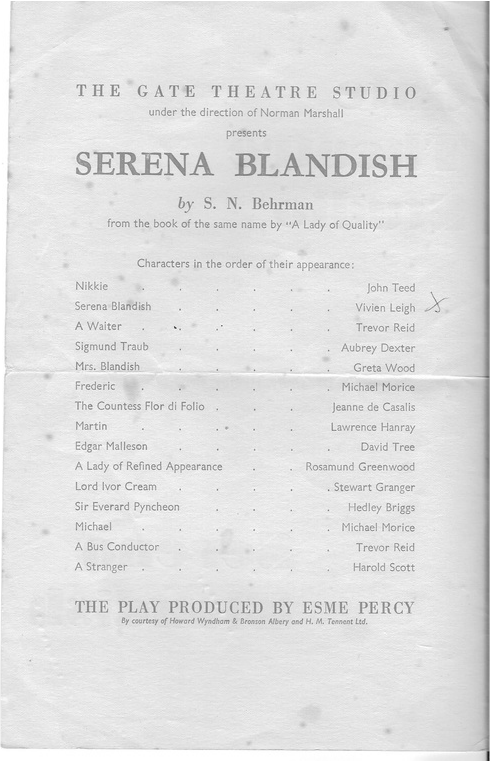 A programme from "Serena Blandish", performed at the Gate, London, in 1938.